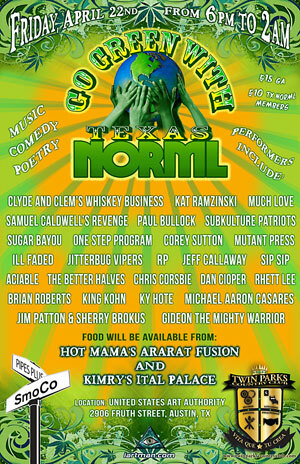 Texas NORML will be holding a mixer/fundraiser event at the United States Art Authority located at 2906 Fruth Street, Austin, TX. There will be a plethora of speakers and performers, please see website for full details. The doors open at 6 pm and the cost is $15. I will inform as soon as I know what time I read, but come early and enjoy the event. Support a good cause, get your poetry, music, comedy and more.